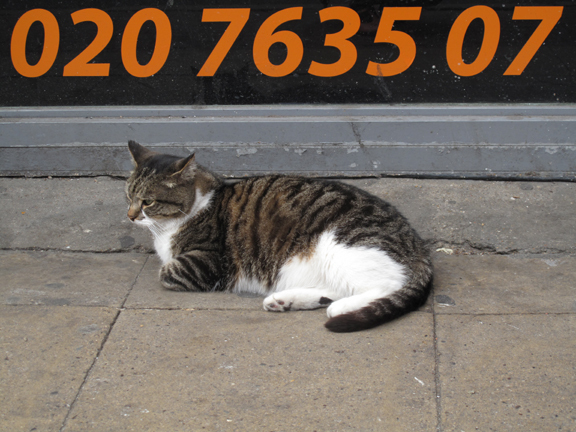 This cat is another of Peckham’s characters and can often be seen on Rye Lane outside an African shop to which, I believe, it belongs. Its habit has been to sprawl (elegantly) on the pavement oblivious to shoppers, buggies, trollies, etc. One is forced to step around it, as one might with royalty. But the other day, it appears the cat met with a belligerent dog and the cat came off worse. At first it was rumoured to have been killed. It wasn’t but it was seriously injured and now has a patchwork of stitches on its chest. Last time I saw the cat it was resting close to the shop, out of harm’s way. This entry was posted in Peckham, Photography, Rye Lane, street photo, Writing and tagged African shop, Cat, Peckham, Rye Lane, street photo. Bookmark the permalink. He’s ok though! Mike stopped and gave him a tickle the other day and he was very playful and seemed rather jolly, despite the stitches. I’m glad he’s all right.